The Eye Test: A Lesson In Myopic Forecasting | How Do I Baseball? With this time of year comes a vast assortment of projections and prognostications for the upcoming baseball season, for both teams and players alike. There’s no shortage of opinions or methods of forecasting what team or player is going to have an unforgettable season. ZiPS. Steamer. PECOTA. All great methods and algorithms to determine how the year ahead will play out. However, I’m going to go rogue, and get all old school on you and give you a player season projection… ONLY USING MY EYES. Yes, I will be using the EYE TEST to determine how well former Baltimore Oriole, current Seattle Mariner, and eternal fan favourite Robert Andino will fare in his initial foray into AL West baseball. OK, truth be told, I won’t be completely supplanting actual data and calculations to determine Andino’s success in favour of my ophthalmic inputs. I will use the ol’ peepers, along with a couple of stats and pictures of Andino from picture days of the last couple of years, to see what kind of year he will have as an Mariner. By now, a fairly iconic picture of Andino. How about some stats (from our good buddies at Fangraphs)? By my piercing, scout-like, Derek Jeter-esque sultry, albeit vacant eyes, Andino is going to have a rough year in Seattle. 2013’s picture is awfully reminiscent of 2012’s, but with more antagonistic seething, and less confused inattentiveness. 2013’s picture is the portrait of a man who knows he’s backing up Dustin Ackley and Brendan Ryan, and he doesn’t have time for that. As determined by my eye test, look for Andino to have a wRC+ of about 60, and a wOBA of around .260 in 2013. A combination of playing home games in a pitcher’s park, and the damp Pacific Northwest weather will depress Andino and his production ever so slightly, as compared to his 2012 Baltimore season. Yet, it isn’t all doom and gloom for Andino, as he will mean mug his way to a career best 8 home runs. While most tend to find picture day a waste of a day, and a distraction from spring training, I find it to be a crucial piece of any baseball scout or prognosticator’s toolbox. A picture is worth a thousand words, the adage goes. 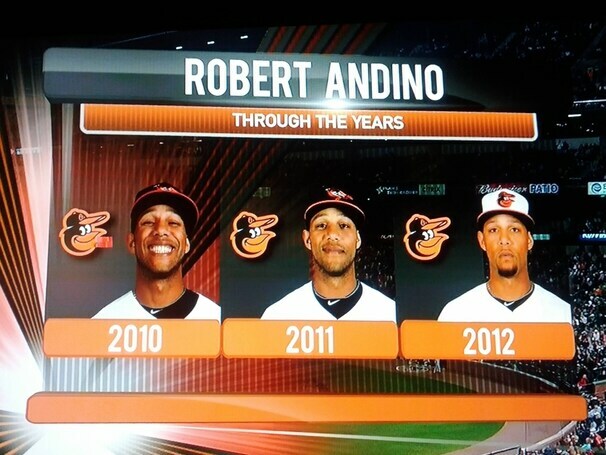 For Andino, a picture is also worth several points on your wOBA.